Separate Connection for "Fog" and "Sound"
Motorized coffin moves in and out of grave. Scary cemetary completely landscaped with grave robbers, pine coffin, and trees. 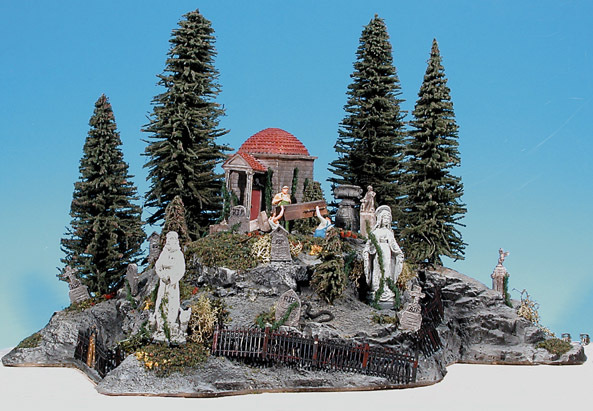 The scene is accented with an ivy covered mausoleum, tombstones, and statues. Large Suethe smoke units simulate fog throughout the animation. Included are random digital sounds of wind, bats, creaking gate, screams, thunder and other haunting sounds. Motorized coffin moves in and out of grave.